Pincar, the Pininfarina family company, owning 50.7 percent of Pininfarina SpA are planning to sell their majority stake in the Italian design and coachbuilding company. Pincar have hired Italy's Banca Leonardo to arrange the sell. Bolloré and Tata are mentioned as possible take over parties. The sale of the 50.7 percent stake held by Pincar was part of a debt agreement with banks at the end of 2008. A source from within Pininfarina said to Reuters: "It is a commitment Pincar made with the banks. The family has no intention of leaving completely." Earlier this week, Pininfarina said Pincar had subscribed for its 50.7 percent share of a 70 million euros capital increase. The increase attracted overall 55.6 percent take-up. Various companies have been touted as possible partners for Pininfarina. 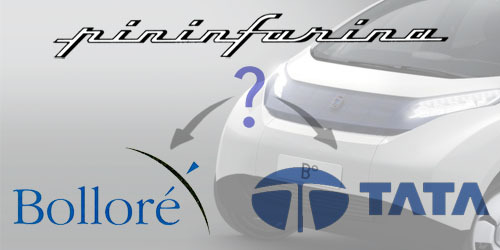 Pininfarina is working with French financier Vincent Bollore on developing an electric car. Bollore has said he would consider taking a stake in Pininfarina. Tata Motors from India, already allied with Fiat SpA, had been mentioned as a candidate as well.